Now that I have (almost) recovered from three days of intense Therap-ing it’s quite remarkable to look back on what went on. I think probably the most remarkable thing is how little I was personally involved in. With 16 sessions running in parallel it just wasn’t possible. What I did hear though as I walked the corridors was how impressed everyone was with the level and quality of presentations both by Therap staff and Therap users. Several times I heard from my colleagues (and the same would be true for myself) that they had learned things from the attendees at a session. As our 2012 National Conference draws to a close, I yet again am incredibly impressed by both our staff and our customers. There has been so much learning going on over the last 3 days I think the must be synapses exploding all over the place! We are all very happy and very tired! Thanks to everyone who made this such a success. Ken, Jeff, and Barry prove how good the they are at folding laundry! What a great day we had to kick things off. It’s quite remearkable to see how many people are here and how enthusiastic they are about Therap. I get most excited when I see groups of people getting together and networking. It’s been very cool to see our state administrators comparing notes and swapping tips on how to make Therap even better in their next of the woods. Today we had our internal meetings leading up to the National Conference. Looking out over all our staff here is really exciting, there are almost as many Therap people here as we had attendees at our first National Conference. It’s a little odd setting into a new hotel after our years in Fishkill, but the Ramada staff here in East Hanover, NJ have been great and made us feel very welcome. If you are coming to our National Conference next week (and I certainly hope you are) and you are arriving on Monday, be sure to look for us and say hi. We’ll be in the hotel all day for some internal meetings (we’re so virtual and distributed that this is about the only time we all get together). We should be done by 4 o’clock, so if you are around after that, we’d love to get together and talk Therap. By Justin Brockie|2015-02-14T12:04:23-05:00February 2nd, 2012|Categories: Provider Admin Conference|Tags: Therap National Conference for Provider Administrators|Comments Off on Coming to New Jersey? I am delighted to welcome Jordan Mar as the latest Therap team member. She will be working primarily with our Mid-West team, but as is the case with all of us, you never kknow where she will show up. Obviously your first chance to say hi will be at the National Conference in a week or two. As a sign of how much people are looking forward to our National Conference, the conference hotel (the Ramada in East Hanover, NJ) is now full. We have arranged to have the same rate available at the Holiday Inn in Parsippany, NJ ( 973-263-2000) and there will be a shuttle running between the two in the morning and afternoon. If you haven’t registered for the conference yet, what are you waiting for? 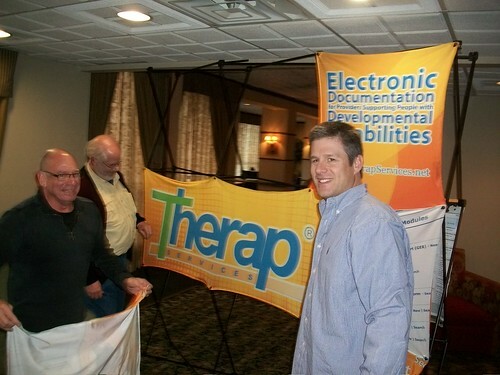 Therap’s National Conference is taking place in two weeks, from February 7-9, 2012. If you are thinking about attending and haven’t registered yet, this would be the time to do it. Like the previous national conferences, our sales and support teams, along with executive members and software engineers will be there to closely interact with administrators – people managing the Therap’s electronic documentation and reporting system for care providers all across the United States. Are you keeping up with the Certified Trainers Blog? If you have taken the time to find your way over to this fine instituation, I do hope that you are also taking the time to read our Certified Trainers Blog. In many ways it is much more interesting that mine! While my focus is on things going on with our application (and of course The Famous Heart of Midlothian Football Club), over there you can read about and interact with the folks who are using Therap on the front lines every day. It’s a great read and shouldn’t be missed. By Justin Brockie|2016-11-03T04:23:54-05:00January 22nd, 2012|Categories: Certified Trainers, Custom Form|Tags: blogs, Certified Trainers, Therap National Conference for Provider Administrators|Comments Off on Are you keeping up with the Certified Trainers Blog?